I never go anywhere without something to read. You never know when you’ll be stuck waiting for a lunch date or a movie time, for a doctor or a freight train (when I lived in DeKalb, the RR tracks crossed the intersection of two major highways). And there’s nothing nicer than sinking into a book or favorite magazine on a long bus, train or plane ride. It’s fun to see what other people are reading and to wonder why they’re interested in that subject. I’ve gotten into conversations with fellow travelers about reading matter. When I was in the middle of Eric Clapton’s autobiography, I debated who is the greatest rock guitarist* with the guy sitting next to me. 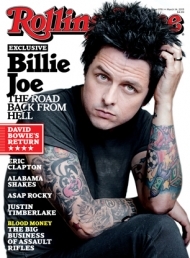 And today I was reading the new issue of Rolling Stone with Billie Joe Armstrong on the cover (the front man for Green Day and now out of drug rehab) and had a discussion about changes in rock and drug culture with a young woman with purple hair peeking out of the hood of her down jacket. Let’s face it. I love my technology; my Kindle, iPad and iPhone are part of my life. I often read the Kindle while commuting because it’s smaller and lighter than the iPad and no one will want to steal it. (CTA riders have to be vigilant.) But I still prefer stashing a book or magazine in my bag – and I enjoy the vicarious thrill of seeing what other people are reading. On a morning bus, you may see students reading law or business textbooks. There’s always a dressed-for-success person reading the latest business best-seller. But the most interesting are the fiction readers. When I see someone reading a novel I enjoyed, I want to talk to him about it – but I usually don’t. On other days I’ll note that everyone sitting around me is reading an e-reader or a phone and I’m blocked from getting any insights into their literary tastes. Book covers are great views into someone’s interests. Too bad e-readers hide the cover that a book designer worked hard to create. I am totally excited about the new Jimi Hendrix album, released this week. Yes, the late Mr Hendrix, who is almost always #1 on lists of great guitarists. Not only was he great, he was left-handed! The new album is People, Hell and Angels – 12 tracks out of the Hendrix vault of officially unreleased music. (Why did it take 40+ years?) You can read about the album here. http://tiny.cc/ksshtw You can listen to one track here. http://bit.ly/14u1ySp I listened to the whole album the other day on NPR First Listen. OMG, it’s good. I Miss Chicago – I Miss the CTA. I am so looking forward to returning to Chicago for good next year!